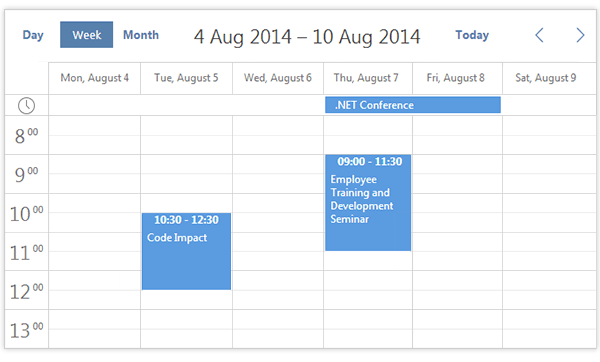 We are glad to infrom you that DHTMLX Scheduler .NET package includes a complete demo project with samples in MVC5 now. The updated package offers the most up-to-date samples of our web control, that is for ASP.NET MVC3, MVC4, MVC5 and for WebForms. All samples support the latest IDEs, namely Visual Studio 2010 and above. The MVC5 examples require Visual Studio 2012 and .NET 4.5.1 or newer. You can download the MVC5 samples directly from our website and start building an elegant event or booking calendar using the cutting-edge technology. Get DHTMLX Scheduler .NET with MVC5 samples right now. Do you need any other samples to be included into Scheduler .NET package? Let us know. Feel free to comment below or send us your feedback.